I’m in Baton Rouge now, and the distance from New Orleans is just enough space to do some thinking uninterrupted by the wailing of a saxophone. Is it disrespectful to say wailing? Don’t get me wrong, the wailing is beautiful. I heard some of the most musically wondrous moments of my life in New Orleans. The city’s historical and cultural hodgepodge is very inspiring (apartments with French latticing and hole-in-the-wall po-boy restaurants on the same avenue? What? Is this Vegas’ dream ego? If Vegas were actually real and more well-read? ), and my eclectic soul is wowed by just about everything. But I was there long enough to see the same buskers days in a row. The crowds followed the same songs, stopping to reflect on a stranger’s sonic heartache or fleeting harmonica happiness on pretty streets four or five times a day. Who needs the south of France when you have France in the South? This was why I found New Orleans a bit overwhelming at first. There were so many expressions of emotions being evoked, conjured, aroused—and so often. After a while, though, through the carnival-esque noise, I could sense something missing. Some unmet wishes, or yearning for elsewhere, some tough crowds, unfilled tip buckets on the sidewalk. Some returning the next day, and the next, to the same corners on Royal Street, same signs as last time. I guess I started to realize that even inspiring momentary splendor for others in the form of a cornet, or masked and beaded dancing, or precious local trinkets at the nightly art market, is a profession. It’s someone’s practice of seeking fulfillment. People do this because this is what they can do to make strangers happy, or part of themselves happy, or at least a living. These are the city’s pretty offerings to its visitors—songs as sweet as powdered sugar—but sweet things so often can make you tired and restless. So that’s how a city so happy can wail. Like the rest of us, the city is looking for the best time all the time. The incessant searching—on Frenchman St, on Bourbon St, in every lounge and bar in the evening—has made a festive and fun tradition of the art of finding meaningful delight. Second lines and krewe parades on the weekends are expressions of pride and sweet sugar—New Orleans has been through a lot, but it still knows how to try and be joyful by referencing the past. The medieval influences in the Mardi Gras and parade culture, tied with Catholic antiquity, tied with African spirituality, tied with the graciousness of an old American South all sing and dance together in the humidity. This is what history looks like finding happy hobbies today: their arts confess love, relive histories, and sustain livelihoods. That’s just the way of life in New Orleans. A daily carnival, a medieval fair, seeking the holy grail of elsewhere, somewhere in its history. We went to the second line parade of The Divine Ladies, a Social and Pleasure Club in Mid City. It was so much fun. Also, they played Drake’s Nice For What and I wasn’t able to get it out of my head for a week and a half. On Melissa’s blog there’s a fun video of the festivities. Even its future-seeking comes from the past. I knew I had to visit at least one psychic in New Orleans. Fortunetellers, who typically use tarot cards that borrow from medieval tropes, line Jackson Square and have offices in every plaza. Though scary or silly for some, psychic readings are fun conversations about intuition, trying to read what we know. Just for fun, here’s a generic reading of my next six months. We talked through the possibilities the cards presented, and my personal reflection and meditation has enjoyed the information. I got a specific love reading and career reading too, but I can’t give all my secrets away on the internet. Drawn from memory. My psychic told me my spread was very positive—a nice confidence boost! So that’s how a city so seemingly happy can wail—because in reality, it’s quite blue. On the surface, New Orleans’ eclectic curiosities might seem fleeting. But really, the city knows how to do two things very well: dwell, and distract itself. Not that that’s a bad thing at all. Maybe that is just what we’re supposed to do. And though I’m in Baton Rouge now, I still smell like its quirky, nostalgic glamour. 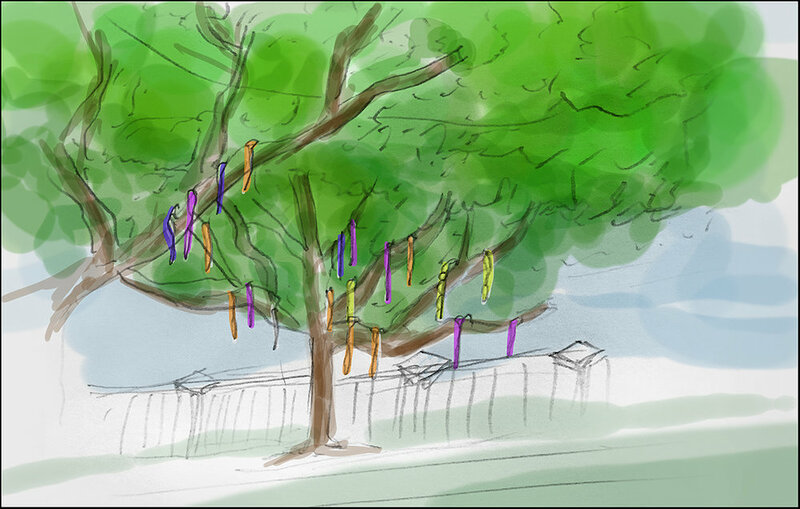 I think I will see beads in trees for a long time. It was my full intention to bring a camera to take photos for these blog posts. Unfortunately, I’m quite forgetful and my iPhone is nearly out of space, so I’ve decided to invest in a mediocre in-house illustrator to supplement my reflections. I’m the mediocre in-house illustrator. Luckily, my daily tasks on this 26-day trip include nothing more than to read, write, and observe. And sketching, luckily, is observation. Unlike photography, it takes a bit longer to develop and is much more reliant on my own memory. Because Louisiana is so noticeably different from what I’m used to, it leaves very distinct impressions in my mind and my sketchbook. I hope you enjoy its quirks, fortunes, and moods as much as I do. The first book we read was The Awakening by Kate Chopin. It’s about Edna Pontellier, a woman who is unlike her Creole husband and companions because she is capricious, unmotherly, and fiercely self-aware. She is awakened by a doomed extramarital love. In this new estuary between her futile efforts for an independent future and her obligations to her rigid socialite past, she kills herself. While reading on the beach, I noticed this morning glory flower popping up in the sand. There were a few sporadically along the shore, but they were always alone. I like reading into things, so I looked it up later: morning glories can signify love in vain, or unrequited love… Funny, right? I read The Awakening for the first time in high school. It was during my interview weekend for USC in Los Angeles, actually. I began to brim with awareness of past lucks and future possibilities as I sat by the fountain for a few hours, in this brand new place. I was both confused and staunchly conscious of who and where I was in the world. Three years later, I’m in LA again. This time, LA is short for Louisiana, and this time, my preferred body of water is the Gulf of Mexico. Our class stayed in a house in Grand Isle, Louisiana for three days. The stilted house we’re staying in is a tall and empty place, but perhaps that’s just because I’m rather short and full right now. Not only did I just have a delicious po’ boy sandwich, which I ate too fast to draw, but my life recently has also been brimming with assorted expectations, plans, and visions for the future. As I prepare to enter my senior year of college, I’m trying my best to will whole dreams together, ground up, inch by inch, by design. My head is forming a thesis back in California. Grand Isle, where my body is, doesn’t seem as intentional. The land is quite bare, and you can tell the houses here were made whimsically. Not that I don’t appreciate a good whim, but the whims here feel fragile. It’s not a confident whim of deciding to run into the ocean barefoot at once. Instead, the town seems undecided in whether or not it really wants to go near the water at all, tiptoeing insecure and hollow steps on the beach, planting colorful whims on toothpick stilts and calling them vacation homes. Grand Isle is an apprehensive estuary. Grand Isle has no plan. Arriving here was a weird reality check. I started to equate my future plans to the pre-fab homes on the Isle. The story of Edna’s futility, in combination with the real, physical estuary where Louisiana meets the Gulf, unearthed some nerves. Again, I’m staunchly conscious of both my wills and my whims. I’m in a muddy middle place between them. Last time I read this book, I had similar visions about the apparently random decisions in my life that led me to my pending future. I just so happened to apply to this new-wave major I discovered last second; I just so happened to be liked enough by admissions to be interviewed. Ideas about love and career and personal purpose filled my eager sunglassed perspective, too, which seemed also to be crafted by “necessarily vague” verdicts of whim, not design. I comically marched around this college campus clutching this book with the word “awakening” in the title and a new self-awareness. I didn’t really know where I was going. Yet, it felt fitting then. We were driving along the island and I was admiring all the colorful, pre-fab homes with quirky placards like “Franny’s Funhouse” and “Crawfish Corner.” This one stuck out to me. In complementary teal and orange, this house was called “Paradox." I had to draw it from memory, but I don't think I will ever forget it. It feels fitting now, too. Though tenuous, the homes of Grand Isle are enthusiastic, if only by their exterior color and for the minute we drive by them. They remind me of the whims of my own adventure considering my post-high school future three years ago, when dreams met applications, which met new faces, then places, then beginnings. They also remind me of all my dabbling since then: the clubs I joined and dropped, month-long interests I tried on for size, projects I failed, and relationships I propelled into and evacuated just as quickly. Here I am again, painstakingly aware of each adventure that led me here. I want to curate a thesis from my chaos. Edna Pontellier knows what it’s like to try to fill what feels empty: I’m trying to design a future out of vacation homes and romantic happenstance, but sometimes it feels in vain. I’m so conscious of who and where I am now. The estuary confuses me. It makes me eager to be on concrete again, or to be submerged in the ocean completely. We visited the cemetery on the Isle. This was the first cemetery I've ever visited. It was another weird middle place, this time between life and death. It was so obvious—there was a children's playground right next to it. The place felt suspended in a past century. I’m not saying I’m Edna. I know how this book ends. But my awakening understands hers: I want to will myself into a meaningful future, and time’s almost up for waiting and wading. There are a few places I’d like to head after USC. I’m thinking about the legacies with which I leave college and embrace my next worldwide adventure. I still don’t really know what’s after this estuary—the stilts barely help my vantage point—but I clutch this book with the word “awakening” in the title because its self-awareness meant something to me once before, and it just so happens that it’s in my life again. We leave the shores of Grand Isle for New Orleans tomorrow, a city I still build in my head exclusively with scenes from The Princess and the Frog. I’m not sure what to expect. I am sure, though, that Edna will come with me along with every estuary I’ve ever waded, like sand that follows you from the beach for a month, for three years, or perhaps a lifetime. Grand Isle is not ready to commit, and I’ve realized I can plan but not predict. Like the Isle, I have to be okay with choosing wavering over waves sometimes. So tonight, I’ll sleep on stilts in sinking sand. Tomorrow, though, we’re off to the city. My future brims and I’m hungry for a coffee shop beignet, which are apparently the holy grail. Si tu savais!